Steven Savage usually does career and citizenship posts over at our Crossroads Alpha Sister Site, MuseHack. But part of a good career and good citizenship is not making terrible movies. In the light of Scott’s analysis of Super Mario Brothers, Steven wanted to put in his own two cents on why the film was awful. Because we here at Psycho Drive-In care. And because the film was bad. I did not see the Super Mario Brothers film until Riffftrax released it. I had heard it was terrible. I know some people still remember it fondly, especially for the late and truly great Bob Hoskins’ performance, but agree the film wasn’t good. So my first encounter with it was with the talented Rifftrax comedians giving their take, which was mainly wall-to-wall sarcasm with intermittent horror at shirtless John Leguzamo. At the end I could really only say that despite the truly marvelous commentary, this was one of the worst films I’ve seen. If you know anything about me, you know that is a terrifying statement. I mean I’ve watched some seriously bad films without commentary. I’m not sure I could handle this one without sarcastic assistance. I can’t imagine the braveness of my friend Scott who viewed it raw for his analysis. But this got me thinking – why was my reaction so visceral? What was going on in my head? Why would I rather watch, say Plan 9 (which is bad, but there’s much worse) than this? So, oddly, inspired by this debacle of a film, I began asking why it was so bad, and what I found surprised me. Let’s go ask: what makes a film bad? First there are many ways a film can be bad. That’s one of the big problems in saying a film (or a book or a game) is bad – because there are different forms of things being awful. These are not the same or even equal. After some analysis I came to the conclusion a film could be bad due to the following elements, or combination of elements. Conceptual: Some films just have bad ideas. They don’t have a good script and concept to begin with. Now some films can overcome this with good acting, clever implementation, and so on. Implementation: A film has to embody the concepts it has properly. If this is not done, then the film essentially is not embodying its core ideas. Implementation is challenging as a poorly implemented film concept makes it much harder for the cast and crew to make it work – whereas having just lousy concepts may at least be freeing. Technical: Some films are technically incompetent, marred by bad vocal work, effects, camerawork, sets, and so on. A good film can overcome these limitations, but they can be a drag or limit the film, as we have seen where a good idea is poorly handled. Casting: Sometimes you have a problem with the cast themselves. A good script, good effects, and people that just can’t carry it or who don’t carry it well can really mess it up. No matter how well you do, the people on screen can doom you. Ethical: Some films may be bad due to what they have to say or what they do. Some political/propaganda and exploitation works fall into this area. These are films that are morally objectionable. So a film could be well made but ethically suspect. A film can have a great idea but be ruined by a bad cast or incompetent director. For that matter a talented cast or director can pull off a bad script and make a decent film in many cases. I’d argue the first X-Men film had a seriously mediocre script and concept, but it was handled quite well. So where does Super Mario Brothers fall in all of this? Let’s check. So let’s take a look at the film and how it faired in the areas it could be bad in. The core of the Super Mario Brothers worlds is a strange, whimsical, almost fairy-tail setting. It’s a cartoon thats a bit surreal, with a memorable cast of broadly drawn and wacky characters and some imaginative settings. Now this is a bit challenging to make a film out of, though as I understand the earlier scripts were more of a comedy. However at it’s heart the Mario world is kind of silly and wacky and likeable. But you do have some strong themes and recognizable elements to work with – it will take effort, and “continuity” in the Mario world is sort of something that happens by accident. But you know what you’ve got. 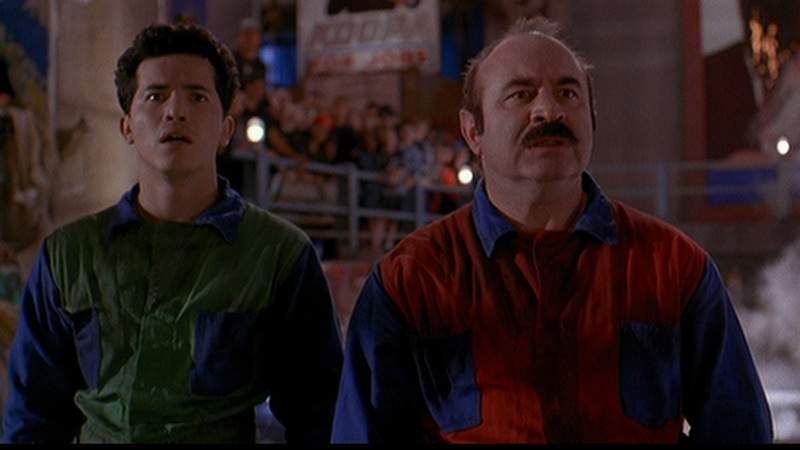 Bob Hoskins as Mario. Hoskins was a talented man with great charisma, and frankly a charming Mario. Good call for a non-standard hero. The fact he is so fondly remembered despite the flawed film is a testimony to his skill. 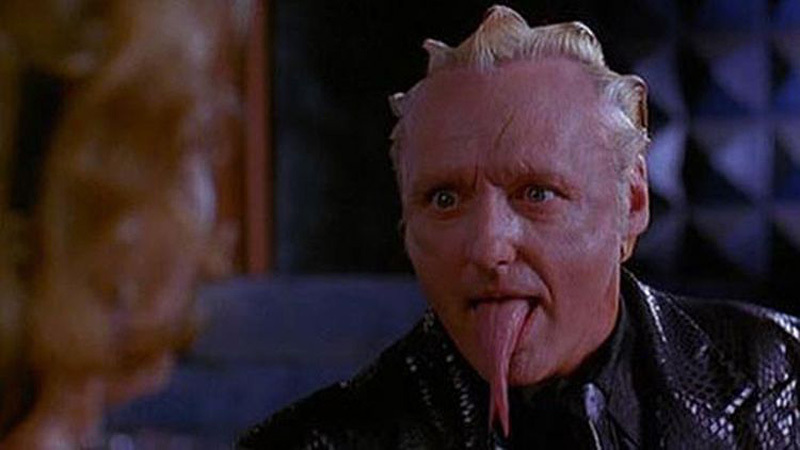 Dennis Hopper as Koopa. Hopper is talented and great at being crazy, a fine choice for a villain. Hopper can dial the insane up to 11, a good choice for the ever self-frustrating Bowser/Koopa. 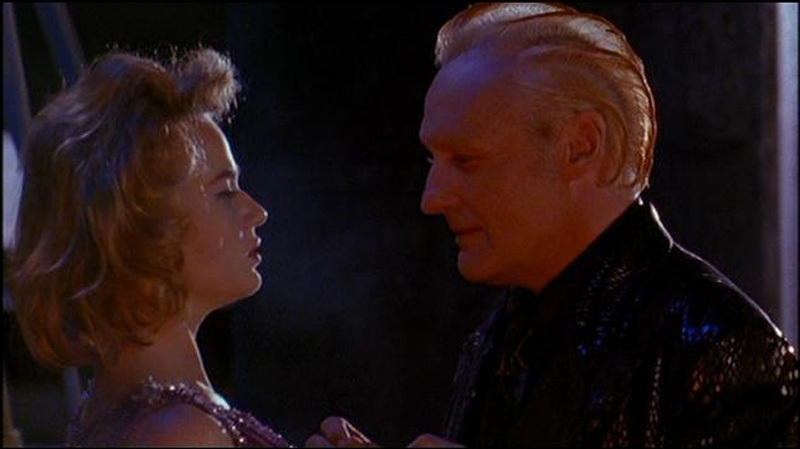 Fiona Shaw as Lena, Koopa’s henchwoman and lover, who had some excellent moments. Not part of Mario’s loose cannon, but a great actress. Fisher Steves and Richard Edson, who showed excellent timing and chemistry as Spike and Iggy. I will note the characters were insanely annoying, but they did actual play off of each other very well, which tells me they could have been used much better. Well, let’s get it out of the way, I expected a hell of a lot better. The sets were ugly, the direction lackluster, the costumes weird in the wrong way. There was clearly money here and the pairing of Morton and Jankel are the people who gave us Max Headroom. Not only did it all look wrong, but it wasn’t even that interesting to watch. “Workmanlike” best describes the direction, and “inappropriate and stereotypical” describes the set. We were basically watching a post-apocalyptic set with uninspired direction. Also light guns used as mice? The weird patches of Goomba slime? You wonder what they were thinking. This was not a film about the Mario Brothers. This was slapping the names of the characters onto two guys, one of who was a legal guardian to the other. This was turning the goofy Koopa into a sleazy politician and an evolved dinosaur. This was a garish, ear-splitting, ugly, noisy movie replete with things that were Not Super Mario Brothers. There’s weirdly sexual elements at a dance club. Big Bertha, a giant fish creatures, is turned into a large, bosomy bouncy wearing fetish gear. No one kills Goomas by jumping on their head, and they’re just de-evolved dinosaur humans going back to . . . er, yeah. I could go on. I could list so many flaws with the film that point out it’s basically not a Mario movie in concept or visuals or use of character or anything. And we get to the crux of it all. This is not just a film that isn’t “really” Mario Brothers. It is not just a film that doesn’t use many elements of the games. This is a film that actually rewrites things and rewrites ideas to not just be not Super Mario Brothers, but to be its opposite. No brothers. No color. Characters turned into something else. Weirdly fetishy elements as opposed to something family-friendly. Screeching noises as opposed to goofy sounds. Dark and dreary and dismal as opposed to colorful. It didn’t just fail, it went out of it’s way to be completely wrong. Oddly I can’t entirely say the film is bad on the ethical/cultural/moral level. It is a bad film, but I can’t call any of the content ethnically questionable. Admittedly marketing it as a Super Mario Brothers movie when it’s the opposite brings up whole other ethical issues I won’t address. So when I look at this film, I can say what makes it rank among the worst films I’ve seen is that it is a shining example of a film doing the exact opposite of its core material. It takes the core materials and literally does the most inappropriate things with them. It goes from being just from being bad to being wrong. It’s not a failure, it’s an anti-achievement, it’s more of a failure than a simple bad implementation, and it takes effort to get it this wrong. So I stand by my judgement in that this film is bad, and bad at a noteworthy level in a specific category – it violates its very concepts by its implementation.. In a way it breaks its agreement with the audience by doing a 180 on what it is based on and what it promises to deliver. Thus I stand by my judgement. I hope that this provides some insight o your own writing and media work and what can go wrong. Big hint? Don’t do the opposite of your concept. Good start. Or lack of start. You know what I mean.